Ever since the world turned digital, how can anyone keep up with this revolution anymore? As content is the mode of communication, users are overwhelmed by the influx of new content every single day. Ten years ago in 2008, Mark Zuckerberg predicted that the world would double its volume of content creation every year thereafter, and right now in 2018, it doesn’t seem to be slowing down at all. Questions to ask: How do you target an overwhelmed audience? 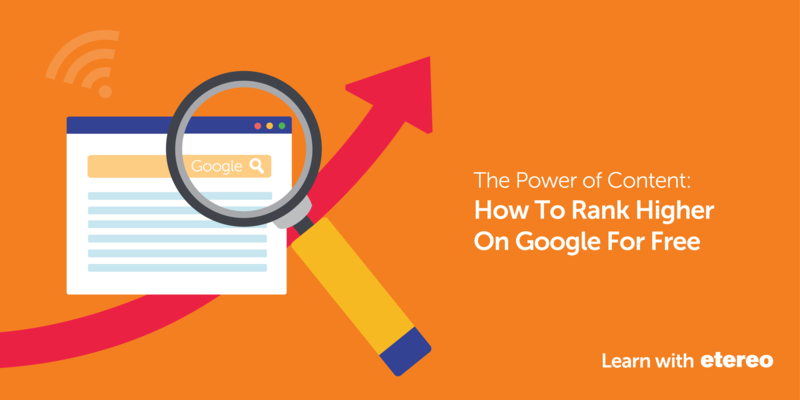 How do you fight for ranking on Google? Is it even possible to get on the first page of Google? With 2 billion websites today, how do we all fight to be on the first page of Google since 97% of the users never click beyond the first page? The main purpose of a search engine (such as Google) helps users discover your content, and search engine optimisation (SEO) helps search engines understand and present this content to users. We have heard so much about SEO in the past decade. Does SEO really work? And if it does, how does SEO improve your ranking on Google? By leveraging on these effective SEO tactics, you have the potential of driving quality traffic to your site and improve your ranking on Google at no cost. Most of the time, the sites you see ranking on the first page didn’t get there by accident. They used SEO to help Google understand what their content is about. Simply put, search results are based on what Google thinks will be the most helpful information to users, using the keywords they entered. Google’s organic rankings are based entirely on what its algorithm determines to be the best results for any given query. One of the most important and effective ranking strategies for SEO is CONTENT MARKETING. Because content marketing makes genuine customers look for you naturally through organic search engine results. Users enjoy content that is well written and easy to follow. Make sure the text is also easy on the eyes for an effortless digestion. Original content will not only keep your existing visitors coming back but also bring in new visitors. Create content that is educational, relevant, entertaining, and trustworthy. Long content of more than 1,000 words tends to rank better in organic search results. Use your audience’s language, and provide the information they’re actually looking for. Always keep your audience in mind when creating content. Proof-read. Content with spelling and grammatical errors often has low credibility. Make your content mobile-friendly. Google uses the mobile version of a site’s content for ranking. Keyword and user intent research are necessary. Once you know what queries your audience are using, what kind of content they are looking for and the demographics of your buyer personas, you can design a better content strategy. Aim to use both medium (2-3 words) and long tail (above 4 words) keywords because a single keyword is too competitive and will automatically push down your ranking. The more quality backlinks you get, the higher your ranking. That being said, it’s better to use a small number of quality backlinks from authoritative and page domains rather than to get a large number of inappropriate ones which may affect your site’s ranking due to spams and you’ll be penalised for this. Social shares and signals such as Twitter’s “tweets”, Facebook’s “shares, likes, and comments” and other social media marketing can boost your link building strategy. SEO isn’t only relevant for your blog posts and website. In fact, YouTube (owned by Google) has become the second largest search engine online. Users are searching for information just like they do on Google. The top SEO tactics in content marketing are quality content in blog posts, social media posts, case studies, videos, and infographics. 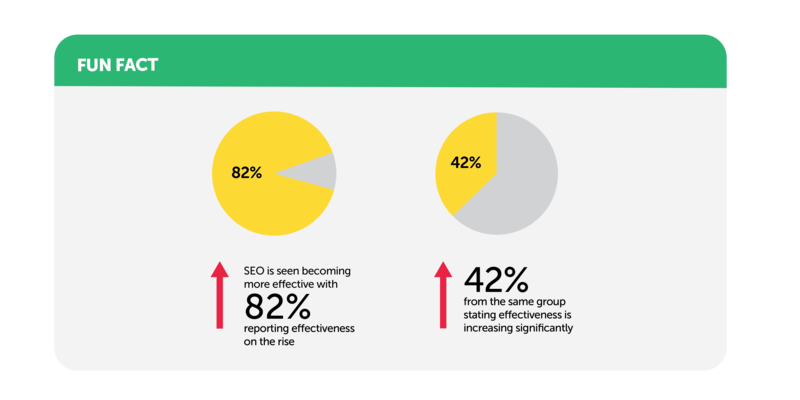 Fun Fact: SEO is seen becoming more effective with 82% reporting effectiveness on the rise, 42% from the same group stating effectiveness is increasing significantly. To put it simply, all SEO ranking factors are there to create the best experience for users. SEO takes time and effort to build which may not bring immediate results. 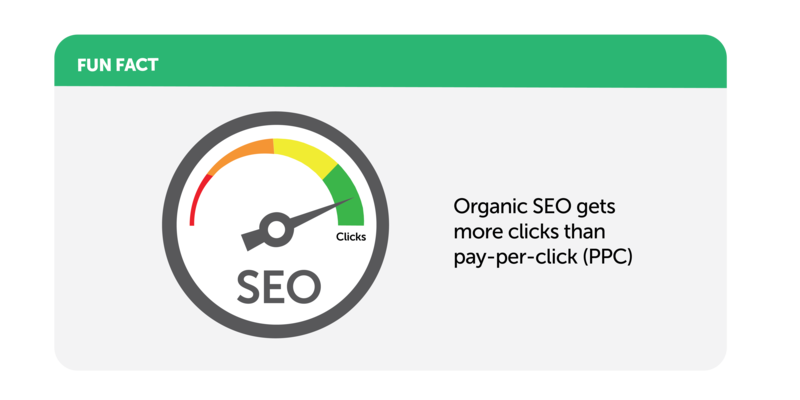 But it will surely pay off in the long run, because SEO is one of the most effective ways to improve your ranking on Google which generates a consistent stream of new leads and conversions.